Chicago’s Red Light District was known as “The Levee,” and was home to some of the most famous brothels in America. 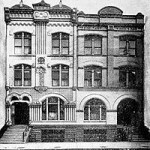 This is a photo of “The Everleigh Club” at 2131-2133 S. Dearborn. The Everleigh Sisters (Minna and Ada) are the owners and proprietors of the club, which caters to a rather wealthy clientèle. Among their famous “visitors,” Prince Henry of Prussia, writer Ring Lardner, boxer Jack Johnson, and actor John Barrymore. How famous is the Everleigh Club? The term “Everleighed” is used as a verb. It was eventually shortened to “leighed” which has since morphed into the more common spelling still used today. 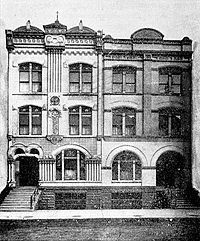 In 1908, the Everleigh Club is operating openly, protected by local police and frequented by nearly all the prominent politicians in Illinois. The club will remain open for a few more years. In 1911, however, the sisters will go one step too far. They publish a brochure and distribute it nationwide, which outrages Chicago society. Mayor Carter Harrison II feels the pressure and reluctantly orders the police to shut down the club on October 24, 1911. Over the next few years the entire Levee district slowly disappears. January 24: An Englishman named Robert Baden Powell begins a movement that he calls “Boy Scouts”. It will be two more years before the Boy Scouts emerge in America. At the Movies: Audiences leaving Nyköpings biografteater (about an hour from Stockholm) in 1908. Price Check: Improved economy cream separator that “runs easier because of the genuine extra length Harding phosphor bronze bushings used on every bearing” is only $26.30. If you travel back in time, and you cut yourself, don’t ask for a Band-Aid. They won’t be called that until 1921.